Alongside the NES Mini, Prima released a lovely book featuring some of the games included on the mini-console to coincide with this. It really reminded us of the old Nintendo Power days and was a nice accompaniment to the NES Mini (that is if you were able to buy one!). To go with the SNES Mini, you'll be able to pick up Prima Games' Playing With Super Power: Nintendo SNES Classics, which is available on 29th September in paperback or hardback. The Games: Discover everything you've always wanted to know about some of the most beloved SNES games, including speedrun tips and little-known facts. We have to say, it all sounds rather nice. Will you be picking this up to go with your SNES Classic Mini? Share stories of how you haven't been able to pre-order a SNES Mini yet below. That's nice, probably won't get a SNES mini though. Depending on how the virtual console works on the Switch, I probably won't be missing much. I hope to get one. Unfortunately I pre-ordered the European SNES Mini version, that does not go with the book. But I still have hope to get an American one. Discover everything you've always wanted to know about some of the most beloved SNES games, including speedrun tips and little-known facts. Everything i wanted to know? What if I wanted maps and walkthroughs instead of SNES information that's been on the internet for years? If it's anything like their NES book, then it's not worth buying. The quality of the images is pretty poor, and surprisingly there are factual errors littered throughout. I hope it's better quality than the NES one, that was terrible. The UK Amazon link says it's unavailable. Is it already out of stock or are they yet to stock it? I wonder if it will contain walkthroughs if if so, which games they will cover. @Don I'm wondering that too. I just hope Prima print it on better paper this time around, I'll pre-order this as soon as the European one gets announced. Also for anyone living in the UK if you have a Works bookshop in your local town they've been selling the NES ones for £7.00! The NES version was a bit poop. I flicked through it once, never touched it again. Then I got another copy as a gift. It was a struggle to feign gratitude for that one, let me tell you. A shame Prima didn't go full retro with this. 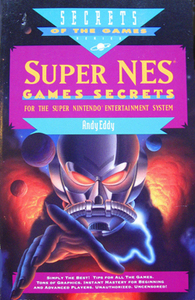 I don't have that exact book but I have a couple other similar vintage books ("Awesome Super Nintendo Secrets") with awesome cover art. I don't plan on preordering. I'll walk into my local Walmart and buy one just like with nesmini. This book looks like it will go nicely with it too. I got a refund for the NES book. The print quality was really bad and the content wasn't all that interesting. Not even considering this one, I'm just glad I was able to get rid of the NES book. There's a SNES compendium book coming that looked way better. Looking forward to finding out more on that one. The NES version was terrible, one of my worst purchases ever. I'll check out the reviews for this one first. The unofficial NES compendium was amazing though, so I've got high expectations for the forthcoming unofficial SNES compendium. I enjoyed bits of the NES one and was glad to get the hardcover off Amazon for less than 20 bucks after they printed far too many and charged too much for the quality. Hope to get this hardcover one for cheap too by waiting a month past launch of the book again. there is way to too much retro knick knack bs to go around these days. I'll probably be able to get this as a nice accompaniment to a plug n play I'll never be able to buy. And unlike the mini itself in America, we can pre-order this! @Jack_Goetz same for me. Can't wait for the Snes compendium to be released, is it coming out in September or November or something? Can't really remember atm. It will be a billion times better than, this, money grab, much like the Snes and NES classic systems themselves. Like they did with the nes compendium. The other book was printed on cheap toilet paper, so nah. Everyone is better off waiting for the now-in-development SNES sequel to a certain NES guidebook. Now that I'm an adult with a disposable income, but really a kid at heart. I can justify buying all the little things that make me happy, but that I really don't need. This book will look great next to my original SNES and hopefully the SNES mini if I can get one. The NES one was a little lacking, noit sure i'd bother again. Excellent packaging though. It's now available to pre-order on the Amazon UK site. The NES book felt a little cheap, but it looked gorgeous and it came in genuinely useful when trying to navigate Metroid! I'm hoping that Prima can this time match the recent Art of Splatoon book, which was of remarkably high quality. I'll wait for the Pat Contri SNES book. It will have every game reviewed. The NES book had terrible paper and printing, so I think I'll skip this one unless I'm sure the quality has improved. As others have said, the NES one was awful. One of the only items I've ever bothered returning and leaving a negative review for. Awful paper and printing quality, factual errors, didn't even cover all the games, and worst of all, they forgot to include the promised Zelda overworld map! It specifically states there is one, then it is nowhere to be seen! The hard cover sleeve looked really nice but the book itself was appallingly rushed and showed no respect for the product or customers. Hey. So is it confirmed Pat is doing a SNES book? I love his NES book and would buy a SNES book in a heartbeat. I can't find anything about a kickstarter or anything on his webpage. Do you have a link at all? I just heard it on his update podcast last week. I think it's a long way off still. He said he won't be reviewing as many games personally this time but he assembled others to help. I have and love the Ultimate NES guide too. It's got all the games and not just blurbs about some of the games. Fantastic! Yes, his NES book was worth every penny. Very high quality. I had a quick look at his youtube podcasts but couldn't see it. Is it the 102 or 103 one? I got my book tonight when i got my snes classic. Cool book. Paper used seems very Fragile. Only concern. As for people wanting maps n such they are in there. Feels like I'm looking at an old Nintendo strat guide. I'd opt for the hardbound one if you can find it.